Two of the three light bulbs inside my 2000 GS300 heated seat switch are burned. The switch itself is good and instead of spending $80 for another switch, I wonder if these tiny little light bulbs (link below) are dealer items that I can buy over the counter? Or if there are part numbers for them? umm..... can you pull the bulb out? 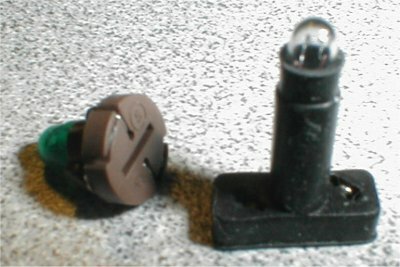 I am pretty sure you can pull the individual bulb(s) out from underneath the heated switch. You'd have to take out the wood trim that surrounds the heated switch and gate shifter, unplug the heated switch and locate the bulb(s) from under the switch. Don't know the P/N of the bulbs, but they may be printed on the bulbs themselves. Those are really tiny bulbs. The wire is thin like hair. I don't believe it is easy to remove from the sockets. I went to the dealer and found out that they do sell the bulbs (with the sockets). For the green ones, they want $14. For the black one, they want $11. For the heated seat switch, they want $140. GEE! Not that I can't afford it but they need to be a bit more reasonable pricing them. And they don't have them in stock. So I walked out empty-handed. To those who have heated seat problem, let me tell you my story. Both seats don't get heated when the switched on. According the the service manual, check the fuse, then the switches, then the heating pad elements. By testing out the switch, I found out how the circuitry is like inside the switch. Even the tiny orange lights comes on, it doesn't mean the heating elements are in working order. And the element works only when below certain temperature (like 75F). My switch tested ok. But two of the three tiny light bulbs in my switch are burned. That is why I headed out to the dealer to buy them. I guess now I need to look for a used switch. After the switch replacment, I will wait for a cool day to test the heating pad elements. Last edited by DEREKC; 08-02-04 at 10:22 AM. So Derek, which bulbs light up the heated switch? The green ones or the black ones? I've seen the green ones before, but they are used to light up the center console (i.e. stereo and A/C unit controls) in my ES. I'm not sure what kind of bulbs light up my heated switches and the gate shifter, although lately the bulb under the gate shifter sometimes doesn't light up and I would have to knock around the shifter plate until it lights up (maybe a loose connection). The green one seems to have a layer of soft membrane on it. It is for lighting up the "seat symbols" so that you can find the switch night time. The black one is for telling the switch is on. Anywhere I can find this heated seat switch at a reasonable price (or not that unreasonable price)? Glad to say I had this problem, and it was really easy to fix (for me). The green back-light and passenger on-light were working, yet the driver's on-light failed... the one light you want working, as a driver, sometimes you don't know the heater is on, until you start getting toasty. We have a great local u-pick place, grabbed a spare switch for a few $, then went to replace it, and the back-light and driver's on-light were also bad. Yet taking apart the switch and seeing how it was built, you can definitely replace the on-lights without taking the switch apart.. .or even out of the center-trim. Put the spare passenger-side bulb in the old driver's-side, and now everything lights up. So yes, it's easy enough to do, whether using salvage bulbs, or new from Lexus. And amazing how that one bulb being out can aggravate so much! Quick Reply: Tiny light bulbs inside heated seat switch REPLACEABLE?